Evolve might be coming out in the worst possible month of the year, but it’s definitely one of the October games you should have your eyes glued to. I’ve played the competitive co-operative shooter twice now, and it always seems to work because of the well designed “individual” parts it brings together. These parts, it seems, also help with future additional content. It’s become all too common for developers to talk about DLC nowadays, even when the game in question hasn’t been released yet. We’ve become accustomed to it, and Turtle Rock have already briefly spoken about some of the things they can add to increases Evolve’s lifespan. More maps, monsters and hunters are on the table to keep the game from feeling too stale and these will be extremely easy to integrate. It comes down to the way Evolve is being designed. Turtle Rock learnt a lot from Left 4 Dead, a game which they say wasn’t designed for post content. 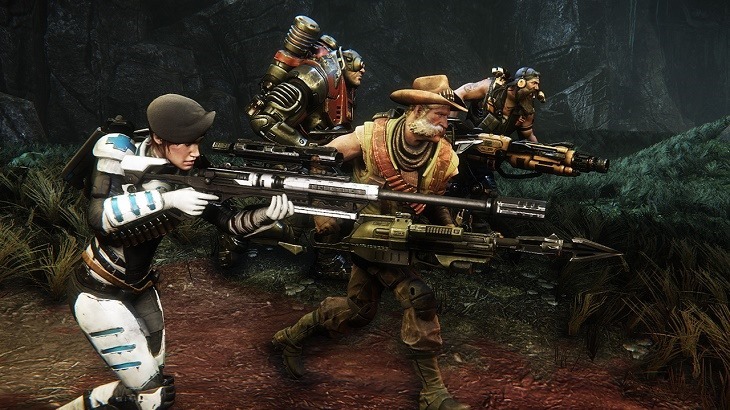 Evolve won’t be the same though, because all of its parts work individually. Think of it as extreme modular design, allowing one piece to be removed and replaced without negatively impacting the rest of the experience. It’s stellar design, if Turtle Rock manages to pull it off. Turtle Rock also understand that DLC and post-launch content is a touchy subject with gamers in general. They are planning to engage with the Evolve community in order to determine what content the fans want, instead of developing stuff that no one will want to buy. The community will have the biggest role in deciding what content should come next, in order for them to continue playing Evolve. Evolve definitely has a lot going for it. It won the critics award at this year’s E3, as well as our Best Multiplayer and Best of Show awards. The game is incredibly fun to play, but in order to work it needs to build a massive, loyal community that won’t abandon the game in a few months. These content plans help, and if Turtle Rock engages with the community correctly to see what they want, they probably have a massive winner on in their hands. Next article Don't cross the streams in this 30th Anniversary trailer for GHOSTBUSTERS!